Using photos or images in your flowchart can make your content more effective and engaging. For more on how to combine text and visuals to get the most out of your eLearning courses, click here. Step 1: Select the Flowchart Template from the ‘Presentation’ panel. Step 2: Drag your Flowchart Template into the Lesson Pathway. Step 6: To start building your Flowchart, select the green ‘Add New Step’ button. 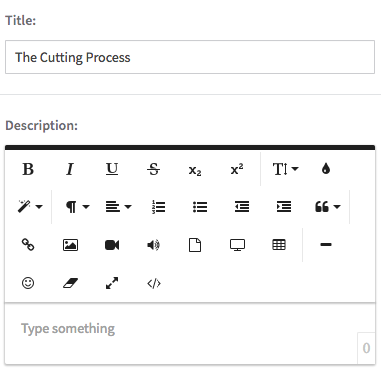 Step 7: Upload an image, add a title, and provide description for your new step. For a tutorial on how to use the ‘Add Image’ button, click here. Image Tips: For the Flowchart Template, your images are dependant on your content, meaning that you may have to play around with your image sizes to see what works the best. We recommend starting with an image size of 280 x 280 pixels and adjusting from there. Note: To add additional steps, simply repeat the process. 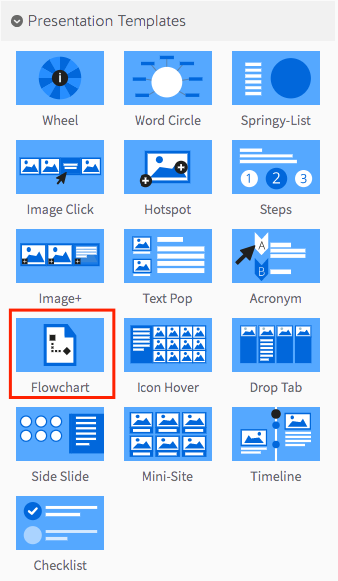 Step 9: To preview your interactive flowchart, click on the ‘preview’ icon.